The Atlantic CITYLAB, Diciembre 16 de 2015. We’re all familiar with the list of superstar cities that power the global economy. London, New York, Hong Kong, Tokyo, and Singapore are among the world’s largest and most dynamic. But can smaller and medium-sized cities ever compete? What are the secrets to building competitive global urban economies? 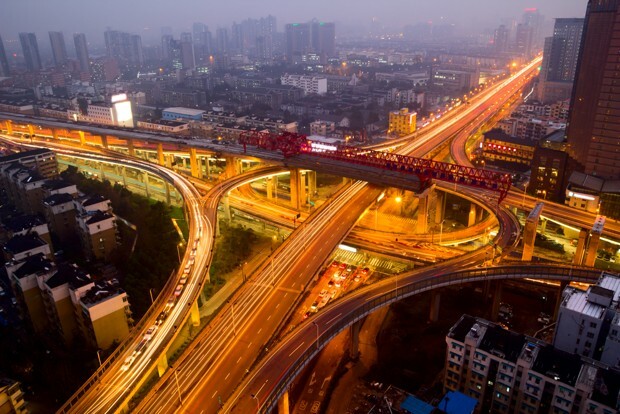 A new report from the World Bank examines the key dimensions of globally competitive cities. The report pulls together an impressive array of detailed economic data for 750 of the largest cities in the world, which it uses to distill the factors that bear on economic competitiveness. Nearly three-quarters (72 percent) of these cities outperformed their national economies in terms of GDP growth. But the productivity advantage of cities and urban areas varies considerably across advanced and developing economies. In the United States, the output per worker in San Jose is twice as much as that of Buffalo, New York—the nation’s least productive large city. But in China, cities like Tangshan and Dongguan are about seven times more productive than their entire nation. Six cities that the report identifies as exemplifying global competitiveness are far from the usual suspects. A much smaller group of cities define the cutting-edge of global competitiveness, according to the report. The top ten percent of the most competitive cities expanded their GDP by 13.5 percent annually from 2005-2012, compared to 4.7 percent for the average city. The top ten percent also saw a 9.2 percent annual increase in jobs, compared to 1.9 percent for the rest. This same group increased its annual disposable household income by 9.8 percent annually, while the top five percent received as much foreign direct investment during the decade before 2012 as the entire bottom 95 percent (note that the report also accounts for the size of a city’s economy). 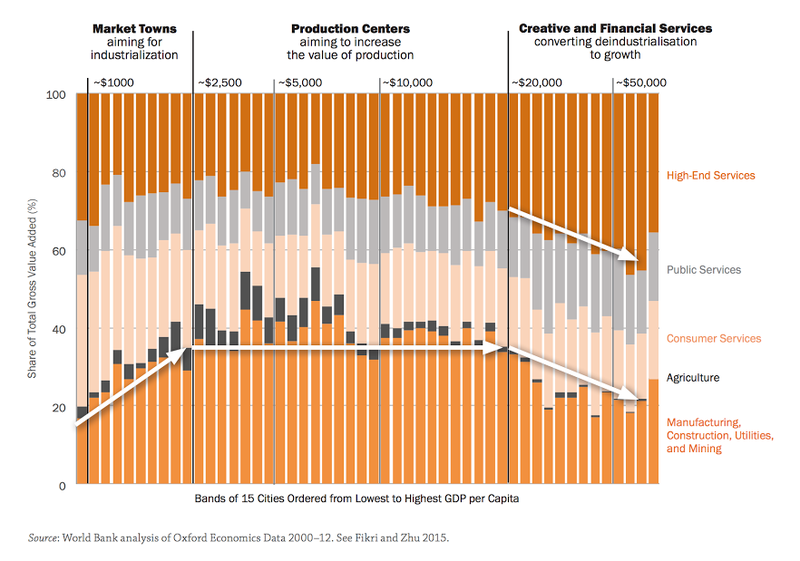 Competitive cities with long-term job growth tend to focus their economies on tradable goods and services. Among the top ten percent of cities with the fastest-growing GDP per capita from 2005-2012, tradable employment growth exceeded non-tradable employment growth by 2.5 annual percentage points. To get at the more nuanced nature of urban competitiveness, the study divides these 750 cities into three basic categories: 150 market towns—with $2,500 or less in GDP per capita—that are in need of industrialization; 405 production centers—with a GDP per capita between $2,500 and $20,000—whose economic activity centers on manufacturing, construction, and mining; and 195 creative and financial services centers, with a GDP per capita of $20,000 or more. The chart below shows the different industries that make up these economies, as well as the total percentage value contributed by each industry. Here we see that most cities have a comparable mix of industries (high-end services, agriculture, manufacturing, and so on), regardless of which category they fall under. The study argues that most cities do not necessarily need to overhaul their economies, but instead to improve and expand their existing structure. The real challenge for cities, then, is how to upgrade their economies from a market town to a production center, or from a production center to a financial and creative services industry. Interestingly, the six cities that the report identifies as exemplifying global competitiveness are far from the usual suspects. They include Bucaramanga, Colombia; Coimbatore, India; Kigali, Rwanda; Changsha, China; Gaziantep, Turkey; and Tangier, Moroc­co. Despite many of them being landlocked or situated in relatively poor nations, these cities have made extraordinary strides in growing the income of their residents. Gaziantep, for example, has increased its GDP by producing 57 percent of all machine-made carpets. And in Tangier, the city has used its port to expand a number of industries such as chemicals, textiles, and mechanical engineering. While the report takes pains to note that there is no silver bullet for urban competitiveness, it identifies some key factors and strategies that bear on it.The most competitive cities focus on higher-skill tradable industries, attracting foreign investment, creating new businesses, and growing their existing, already competitive firms (which usually has the biggest impact on job creation). They also have strong growth coalitions of elected leaders, civic officials, and the private sector. Most importantly, they have a clear strategy to exploit their competitive advantages. In Bucaramanga, Colombia, for instance, the city has used its oil revenues to invest in universities known for their research on the oil industry—in turn generating technical skills and boosting human capital. It’s this kind of creative and independent thinking that allows cities to do a lot with a limited amount of resources. Of course, not every city can stand up against global powerhouses like New York, San Francisco, London, or Shanghai. But smaller and medium-sized cities provide a welcome example of how all cities can leverage their unique resources, firms, and talent to become more prosperous and sustainable places to live. Top image: fuyu liu / Shutterstock.com.